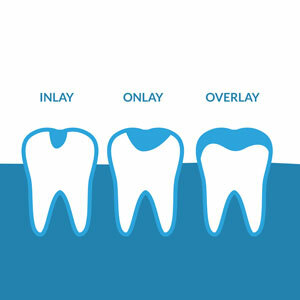 Inlays and onlays serve as an alternative to full dental crowns and they cover the biting surface of your tooth. Just like fillings, they are used to successfully treat and stop tooth decay in damaged teeth. At Rouse Hill Smiles, we use the high-quality porcelain to create our inlays and onlays .Rather than approaching inlays and onlays from a cosmetic standpoint, we choose to utilise this treatment as a restorative option to help patients achieve optimal oral health. Inlays and onlays prolong tooth life and prevent the need for more dental treatment further down the line. Are You a Candidate for Inlays and Onlays? If your tooth is too severely decayed for a dental filling, yet not damaged enough to justify fitting a crown, then an inlay or onlay may be the answer. Dr Teena assesses each case on a patient-by-patient basis to ensure everyone can receive the treatment most suited to their needs. Dental inlays and onlays can also be used when old fillings (such as those containing Amalgam) need to be removed or replaced. When you come in to our practice to receive an inlay or onlay, your initial consultation will involve having thorough scans and impressions taken of your mouth. Dr Teena is then able to perform all of the necessary prep work for your treatment, before fitting a temporary inlay to remain in place until your next appointment. After a period of two to two-and-a-half weeks, your permanent solution will be ready to be fitted in your mouth. Dr Teena will also discuss how you can maintain your results, to ensure they last long-term. If you have a tooth affected by decay, a dental inlay or onlay may be the perfect solution. Book a consultation with Rouse Hill Smiles today to find out more.